Preheat oven to 200C/180C fan-forced. Line a large oven tray with baking paper. Combine cream cheese, spinach and parmesan in a bowl. Season. Spread cheese mixture on bottom half of each slider. Sprinkle with 3/4 cup mozzarella. Top with slider tops. Arrange sliders on prepared tray, leaving a hole for salsa. 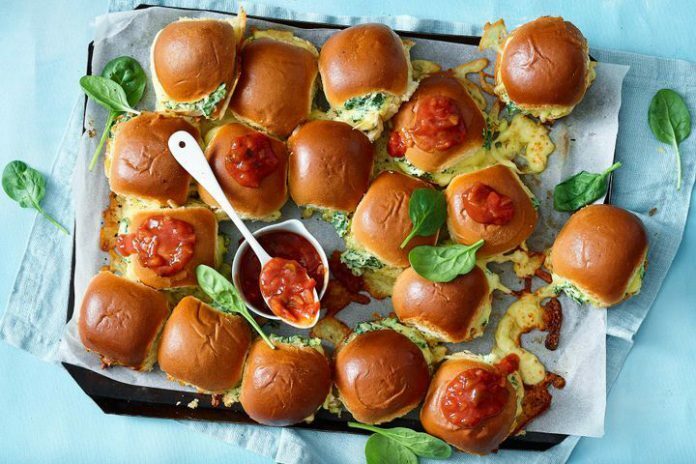 Sprinkle remaining mozzarella around sliders. Bake for 10 to 12 minutes or until cheese is melted and lightly golden. Place salsa in hole on tray. Sprinkle with extra spinach. Serve.